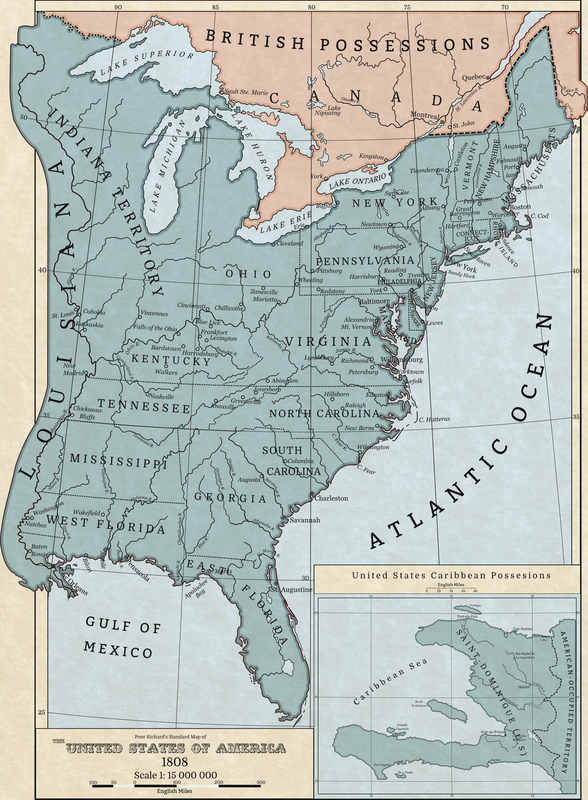 First up for my map posts is a mini series of maps I did over the summer, depicting an alternate history of the United States. I originally planned to write out a literary timeline for each of them, but then realized that I could make maps better than I could write. At least, I think so, but I can let you all decide at some point. Anyway, the historical summaries for both maps are below, and the pictures themselves. As always, click on the picture for full view. The point of divergence here is that the riots outside of Independence Hall in Philadelphia during the drafting of the Constitution are avoided, leaving Philadelphia as the capital of the United States rather than pushing the delegates to move the capital to a newly-built one. Butterflies flap from there, and the United States, under President Alexander Hamilton, go to war with Revolutionary France in 1799, capturing Saint-Dominigue (modern day Haiti) and Louisiana from the French. The French Republic is quickly defeated in Europe as well and collapses. This causes both the United States to grow closer to Great Britain and grow emboldened in its ability to fight European nations. Over the next decades, the United States rapidly advances across the American continent, fighting a brief war with Spain to free Mexico in the early 1820s. However, Mexico establishes an unfriendly imperial government, one who antagonizes the United States and the settles within the province of Texas. War comes, and the United States takes Texas in the peace after they smash the imperial government with the help of the Mexican people, who establish a republic. Following the peace, the US focuses on northern expansion. A treaty with the British in the late 1820s give almost the entire Red River Valley to Canada, a valuable prize the British covet. In exchange, the British give up official claims on the Oregon Territory, and American settlers quickly claim the entire territory. Before the century is out, American settlers move up all of western North America, straight to Russian North America. With tensions between Russia, Britain, and Britain's ally Prussia high in Europe, and with the US still at least an economic ally of the British, the Russians sell Alayska to the USA before it is taken from them by force. Meanwhile, in the south, the United States' hands off policy with Mexico resulted in an anti-American dictator seizing power and making noise about taking Texas back. One too many border tensions later and the US invades and takes all of California, the Baja Peninsula, and bits of northern Mexico in the peace deal, and establish a government backed closely by the United States. The government is somewhat-surprisingly effective at bringing stability to Mexico, particularly through American money. The US-backed Federal Republic of Guatemala to the south is less so, however, though by 1954 they have begun to rise up out of poverty. In the Caribbean, the United States is king. Originally, the US only uses Saint-Dominigue as a dumping ground for freed slaves, but after the brief Southern Rebellion which freed all the slaves, they began to take a greater interest in the region. Uprisings against Spain were taken advantage of, and the United States quickly swallowed up Santo Domingo, Cuba, and Puerto Rico from Spain. All new territories were put on the fast track to statehood by the Whig-controlled government, who needed the voters. The British mostly got the rest of the Caribbean for themselves. More importantly, however, British capital provided for the building of a Nicaraguan Canal, a source of tension between the British and Americans that was only soothed over by special privileges for American shipping. Despite not having a western coast, Canada has done quite well for itself. With the addition of the Red River Valley, the amount of arable land increased in early Canadian history, and drove more settlers to the colony. Westward expansion swept Canada like a fever in the latter half of the 19th century and early 20th, especially as the drive for emigration to Canada greatly increased in Britain. In particular, a large boost of settlers came over following the Bruges War in the early 20th century when French dirigibles firebombed London and caused thousands to flee.By 1954, Canada is the most populous and powerful of the British dominions, and has grown its own national identity. In a more tumultuous world, though, that identity has as of yet been put aside to stay with Britain and preserve the empire for as long as possible. 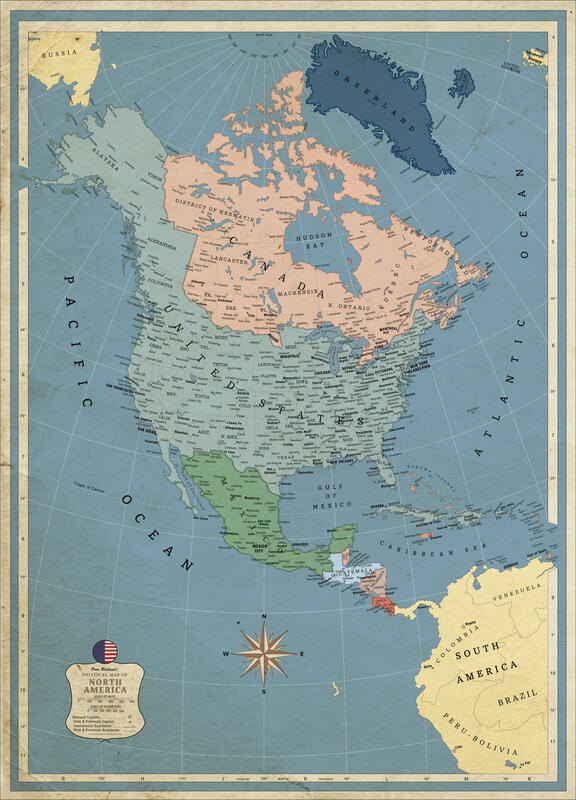 By 1954, the clear winner in North America is the United States, the colossus that stretches from Dena, Alayska to San Juan, Puerto Rico. After coming to the aid of Britain in the Belorussian war, the combined allies of Prussia, Britain, Netherlands, Sweden, and the United States overcame the alliance of Russia, France, and the fledgling Turkic Empire. In the postwar world, American goods flow around the world and the standard of living is higher than anywhere else. Philadelphia is the largest city in the country, but New York City and Chicago threaten to overtake it as trade, whether from rail or ship, boosts their economies past what any many could have dreamed fifty years before. However, the US, for the first time, must begin to turn its eyes east as unrest in China threatens to unravel the peace the world has found itself in.